Having finished Braid this week in the Monthly Game Club, we're left with many questions about the meaning of the game. One thing is certain, however: Braid stands as a profound example of the quality and polish possible in the world of independent games, and the level of intelligence possible in all video games, independent or otherwise. 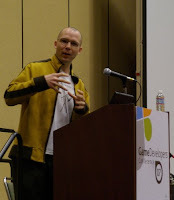 Jonathan Blow, the developer and designer of the game, was kind enough to answer a few questions for us on being an independent game developer, the role of interactivity in games, and the inspiration for Braid. Your game was independently made, but first released on Xbox Live Arcade. Would you share a few thoughts with us on being an independent game designer working with a huge corporation like Microsoft? Whenever dealing with a company like this, you usually work with a (relatively) small division. I don't really know what kinds of politics goes on there, because for the most part Microsoft is good at isolating developers from that. Usually I would be dealing with just 1 or 2 people, and spending most of my time making the game. Because they had done a lot of Arcade titles before Braid, they did a pretty good job of ushering games through the approval and certification process with minimal BS. I did have one episode late in development where someone on the Microsoft side who I had never talked to decided to monkey with the game at the last minute in an unexpected way, and that was a very negative experience, but ultimately I decided to go ahead and release the game on XBLA anyway. Largely, though, it was a hands-off experience: my job was to make a good game, and the job of the guys I talked to at Microsoft was to help me get that game onto their service. How do you think services like Xbox Live Arcade, Playstation Network, and WiiWare are affecting the independent gaming world? It's definitely a positive thing that independent game developers have these places to sell games where they can find a large audience and where the piracy rate is relatively low -- it means that it's much more feasible now to make a living as an independent developer than it was 10 years ago. Braid has been cited as an example in the continued debate about whether video games can be art. What do video games need to do to be taken seriously as an artistic medium? All that needs to happen is for game developers to do more-serious work. The appreciation will come from that, naturally. Right now, the work isn't there. Most of what we do as an industry is about pandering and infantilism. If enough of us just stop doing that, we will find that there is an audience out there that takes us seriously. How does interactivity change the ways ideas or stories are explored? It just leads to the contemplation of a different field of ideas than something like film or music does. I can't say how that is "changed" from another medium because they aren't necessarily related that closely. There are connections, sure, but each one is in its own right a wide and deep body of stuff that can't be easily summarized. That's why we use these media to explore these things! If I can just say what the point is, then we don't need games in the first place. Braid uses a number of innovative game mechanics; did the story inspire the gameplay, or vice versa? The whole thing came to mind at roughly the same time. I would say that maybe the gameplay idea came first, by a very thin hair, but it was a very general idea -- that the way time behaves would change from world to world, though I didn't know what those behaviors would be, and in fact had very different ideas about these time behaviors initially than what ended up in the game. But as soon as I had that concept, I knew that I wanted the game to be done in the tradition of Italo Calvino's book Invisible Cities and Alan Lightman's book Einstein's Dreams, and that there would be textual pieces introducing each world. From the very first day, Braid was conceived as a videogame with its story presented in the tradition of a few books that I respect, and maybe a film or two. Do you have any advice for aspiring independent game developers? The most important thing is to make games and get them done. The second most important thing is to ensure that those games are the best things that you can make, whatever that means to you. Unfortunately these two goals are in conflict. Would you like to share with us what you're working on now? Every time I answer this question, it's something different. I have four different games that I have taken to the prototype stage since finishing Braid. I keep changing my mind about which game is really my next project, so I would just be misleading you if I gave a concrete answer here! Oh, I want to hang out with him. He mentioned Alan Lightman! Also he made this game, which is pretty neat. this was an interesting piece. If anyone is interested in Blow's work or hearing him talk about games, I would also recommend the NYU game center podcasts he has a discussion of his game background and also a a sit-down with Frank Lantz. It's good stuff. From what I can glean of his words around the Internet in interviews and blogs and such, he always comes off as more than a little... high-and-mighty, I suppose. Still, I can't deny that I did absolutely love Braid, after all. It seems to me that if you've made a game as good and successful as Braid, you sort of have the right to speak with authority on these subjects. I certainly would like to see more of the games industry heed his advice.